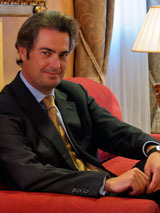 Mr Escarrer is Vice Chairman of Sol Melia, which was founded by Gabriel Escarrer Julia, Mr. Escarrer’s father, in 1956 in Palma de Mallorca (Spain), is the world’s leading hotel chain for holidays, as well as being the overall market leader in Spain, both in the leisure and the business sectors. It is the third largest chain in Europe, the twelfth largest in the world and is the global leader for holidays and in Latin America and the Caribbean. Currently there are more than 300 hotels in 30 countries on 4 continents and the company has a workforce in excess of 35,000 employees. After graduating from ICADE, Mr. Escarrer held several positions in multinational companies such as the Coca-Cola Corporation, the First Boston Corporation, IBM Corporation, Hyatt International and the Mac-Gemini Group. In 1993 he joined Sol Melia as the assistant to the Vice Chairman and in 1994 he became Chief Executive Officer.